Enter the net income reported by the company using numeric characters only (no currency sign or commas). Enter the dollar amount of the dividends paid on preferred stocks using only numeric characters 0-9, and a decimal point if applicable. Enter the number of common shares outstanding. Preferably, this should be the weighted average. Clicking on the link on this line open the Weighted Average Shares Outstanding Calculator in a new window. If the company has any convertible securities, be sure to include those in your entry (fully diluted earnings per share). Based on your entries, this is the earnings per share (EPS) ratio of the stock you are investigating. You can now use this figure to calculate the company's P/E Ratio. You can also use the earnings per share ratio to compare a company's earnings with previous years' earnings (to see how earnings are trending), as well as to forecast future earnings growth. 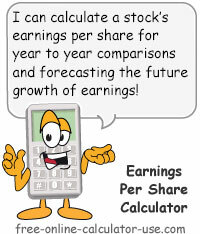 This free online Earnings Per Share Calculator will calculate the EPS ratio for a stock given the net income, preferred dividends paid, and the number of common shares outstanding. If you don't know the answer to the question, "What is EPS? ", it may help to visit the Learn for information related to what EPS is, how it's calculated, and what may or not be included in it -- before using the calculator. Enter the company's reported net income. Enter the preferred dividends paid. Enter the average common shares outstanding. Click the "Calculate EPS Ratio" button. What EPS is and how it's calculated. EPS is an acronym for Earnings Per Share. Earning per share is one of the figures used in calculating a company's P/E Ratio (price to earnings ratio) and is also often used by investors to compare the growth (shrinkage) of a company's earnings from year to year, as well as to forecast future growth of earnings. EPS comparisons and forecasts can then be used for deciding which stock to purchase shares in and/or when to sell a shrinking EPS stock in exchange for buying a growing EPS stock. EPS is calculated by subtracting the preferred dividends paid from the net income, and then dividing that result by the average number of common shares outstanding. For example, if a company reported a net income of $25,000,000, preferred dividends totaling $1,000,000, and an average of 12,500,000 common shares outstanding, the earnings per share ratio would be 1.92 ((25,000,000 - 1,000,000) ÷ 12,500,000 = 1.92). One thing to be aware of when seeing an increase in a company's EPS ratio, is that the increase may not mean the company had a growth in sales. This is because it's possible for a company to increase its EPS simply through buying back its own stock. This stock buy back reduces the number of outstanding common shares without effecting net-income -- thereby inflating the EPS figure. That's why it's important that you study the company's financial statements in order to determine the real reason the EPS increased. If a company has convertible bonds, convertible preferred stock, "in the money" options, or any other types of securities that can be converted to common stock, the company's EPS figure might be diluted from the increase in common shares outstanding that would occur if and when the securities are converted. If a company has any of these convertible securities they are then required to disclose what is referred to as, their fully diluted earnings per share.